Science has documented that life on earth has been destroyed many times before human history even began. Extinctions from super nova gamma radiation, coronal mass ejections (extreme solar flares), global warmings and global coolings (ice ages) have all probably taken place (see post: Real Apocalypse). The Pleistocene (Permian?) extinction is thought to have been associated with increased volcanic activity, perhaps a natural cycle in the planet's history, perhaps triggered by an asteroid or comet strike (impact event). 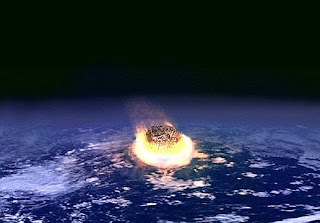 Sixty-five million years ago, the extinction of the dinosaurs is also believed to have been due to a comet or asteroid strike near the present-day Yucatan peninsula. The destruction of the cities of Sodom and Gomorrah is thought, by some, to have been caused by an asteroid strike as well (see post: Calamity (from Earth) in the Holy Records). In 1519 the ruler of the Aztec empire, Moctezuma, witnessed a portentious event, a comet in the sky which foretold the return of the god Quetzalcoatl. 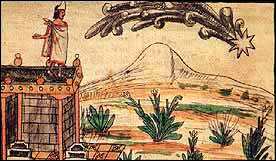 The comet itself did not cause destruction but, instead of Quetzalcoatl, it was Cortez who arrived later that same year, leading to the demise of the Aztec civilisation. Our own sun has also been implicated in death and destruction inflicted upon our globe. Ancient Egyptian texts talk of the time when the sun disappeared from the sky, night lasted for weeks and then the sun rose for the first time in the east. Previously, the sun was said to have risen in the west (sudden reversal of the rotation of the earth?). What could have been a halt in the planet's rotation was described in the Bible, Joshua 10:13 ('the sun stopped in the middle of the day and delayed going down for about a full day'). 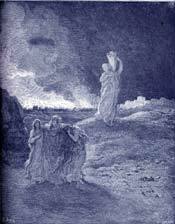 In Joshua 10:11, a fall of stones (hail?, meteorites?) was described, killing many of the Israelites' enemies. The Maya in Mesoamerica predicted a change of age or end of the world scenario (take your pick) for December 2012 in association with planetary alignments. *Symbols of religion and apocalypse: subject of research for the novel The Tao of the Thirteenth God - Amazon Kindle.